My book shelf is full of novels that I have continued to buy, despite the fact that I haven’t actually finished reading the previous ones up to date. 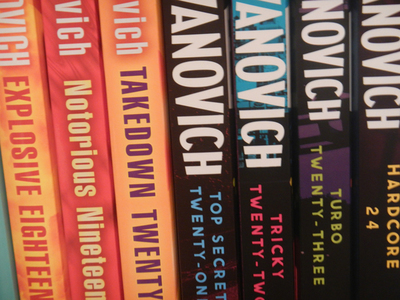 For example, I have been collecting Janet Evanovich’s Stephanie Plum series since I first picked them up in high school. Each time a new book has come out in the series, I have purchased it and added it to my collection, despite having only read up to (maybe) book twelve. Book number twenty-five is due in November. Do you have the same problem as me, and continue to buy books that you may never read, just because they are part of an ongoing series? Do you think you will ever get around to reading them? How long before you say ‘enough is enough’? Besides Janet Evanovich's series, I have also bought (and continue to buy) each new issue of the graphic novel The Walking Dead, (although I have actually kept up to date with reading those). I guess I'll just keep going with all of them until the series' reach their ends.